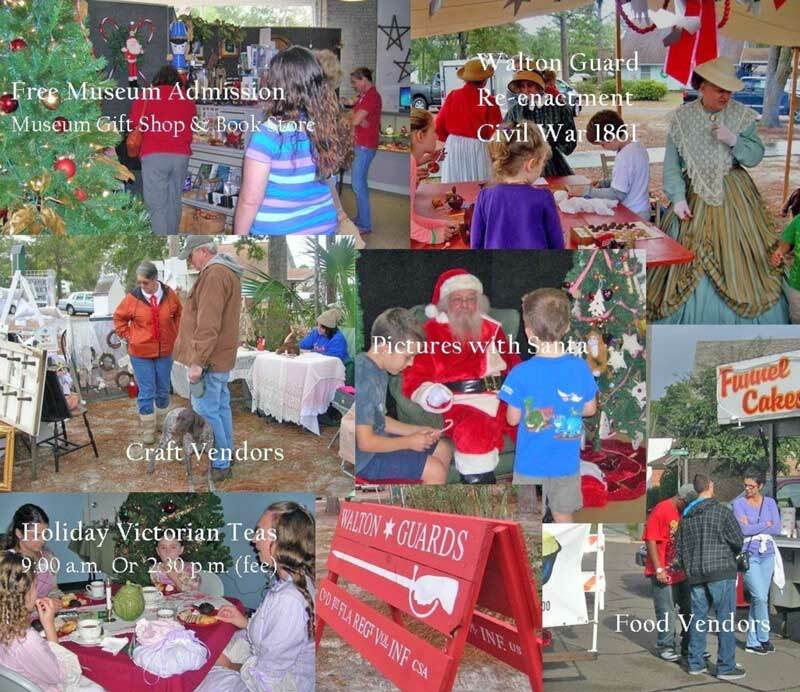 The 2014 Yule of Yesteryear, a free family fun holiday celebration presented by the Heritage Museum of Northwest Florida, will be held on Saturday, December 13, 10 a.m. to 4 p.m. The Spirit of Christmas will fill the air with music from local Christmas choirs and bands. Enjoy story-telling from the Valparaiso Library, ornament making and a special visit from Santa Claus. Free picture taking for parents. Witness traditional craft demonstrations, a re-enactment of a Civil War Christmas of 1861 by the Walton Guard, and shop for unique gifts and affordable stocking stuffers from local craft vendors in Perrine Park and in the Heritage Museum Gift Shop and Bookstore. Food vendors will be serving yummy foods outside, while the Museum will have mulled cider and scrumptious sweets inside at the Heritage Museum’s Holiday Bake Sale. Two Holiday Victorian Teas will also be held, 9 a.m. and 2:30 p.m. (fee charged). The annual Christmas Tree lighting in Perrine Park will conclude the event. Bring the family and enjoy Yule of Yesteryear at the Heritage Museum of Northwest Florida. The Heritage Museum of Northwest Florida is located at 115 Westview Ave. in Valparaiso.